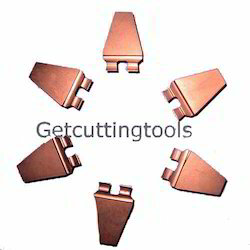 Manufacturer of a wide range of products which include double grooving carbide inserts. Our organization has successfully expanded its business in market owing to the offered elevated quality array of Double Grooving Carbide Inserts. The offered inserts are manufactured by utilizing high grade raw material and advance technology by our skilled engineers. Apart from this, our inserts are tested on various parameters in order to ensure its sturdiness and quality. Clients can avail these inserts from us in different specifications and at affordable prices.